Innovation as opposed to invention is a highly collaborative affair. An inventor can work in isolation, deep in the bowels of a lab. In contrast, innovation that is realized in the marketplace, as measured by delighted customers and revenue, necessarily involves many people in a highly collaborative and iterative process. Though the innovation (concept to commercialization) process differs by organization, successful products and services launched today and in the future involve many people within and beyond the immediate organization. These people contribute relationships, knowledge, and experience. 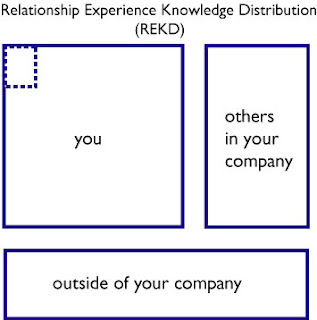 The Relationship, Experience, Knowledge Distribution (REKD) diagram conveys this idea. You, denoted by the largest box, have a finite amount of relationships, experiences, and knowledge that is useful to realizing an innovation. The box to the right of “you” represents your colleagues, others in your organization. To be successful you need to partner with others in your organization. For example, if you are the lead inventor, you might need a product development team to build your widget. You will need marketing and executive sponsorship to carry it forward and get noticed in a crowded marketplace. Further ensuring your success, you will involve media, analysts, channel partners, customers, etc., all denoted by the bottom box since these people typically exist outside of and in spite of your company. Note, the relative sizes of the boxes may be different than shown depending on what each party brings to the table. It is likely that you are the tiny, tiny postage stamp inset box and with those around you bringing many more relationships and much more knowledge and experience. To be successful in the marketplace it is essential that you tap into your colleagues as well as the ecosystem that lies outside of your organization. Swimming and Diving is a metaphor for shared learning and evangelism inside and outside of the organization. Think of the realm of possibilities (all possibilities as the ocean). This is fitting since people often say things like there is an ocean of opportunities out there. Yeah - sure there is but what are you doing to realize those opportunities? Hopefully you are not trying to "boil the ocean." See, the metaphor continues to work... The ocean is deep and wide. All others exist in this vast space as well, customers, alliances, partners, investors, future employees, competitors, devices your product or service will interact with, etc. 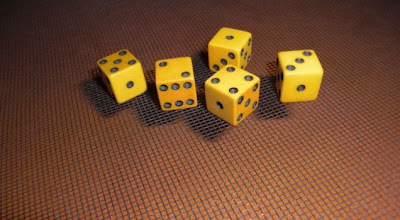 Your challenge is swimming out of your immediate vicinity to others in your organization. You need to share with them your knowledge, experience, and relationships as well as make sure you are leveraging the same from them. Sometime this will be a surface activity; at other times this will be deep dive stuff. The metaphor continues to work. In the first case you have a swim partner, sometimes even synchronized swimming; whereas in the deep dive you’ll need a dive partner. This metaphor doesn’t stop at the boundaries of your organization. You will also need to swim and dive with suppliers, partners, customers, and others in the ecosystem to deliver compelling experiences around products and services. 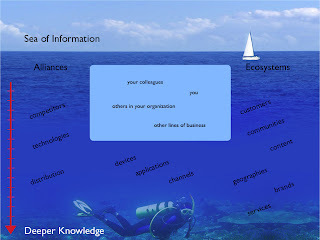 Dive deeper for more knowledge and swim across to reach out to others in companies that can help you realize your innovations in the marketplace. Good swimmers and divers find treasure, save isolated, endangered swimmers, and stay fit. Remember you can’t swim everywhere or you will fatigue - stay focused. Also, you can’t hold your breath for too long; even with a high capacity dive tank you’ll eventually need to surface. Swim and dive responsibility and help others to do the same. While you might not make the Olympic swim or dive team you may win in the marketplace and the hearts and minds of your customers, partners, investors, and colleagues. "Imagination works so quickly, quietly, and effectively that we are insufficiently skeptical of its products." Daniel Gilbert, Harvard College Professor Psychology at Harvard University. Author, Stumbling on Happiness. "And it ought to be remembered that there is nothing more difficult to take in hand, more perilous to conduct, or more uncertain in its success, than to take the lead in the introduction of a new order of things. Because the innovator has for enemies all those who have done well under the old conditions, and lukewarm defenders in those who may do well under the new. This coolness arises partly from fear of the opponents, who have the laws on their side, and partly from the incredulity of men, who do not readily believe in new things until they have had a long experience of them. Thus it happens that whenever those who are hostile have the opportunity to attack they do it like partisans, whilst the others defend lukewarmly...."
Niccolo Machiavelli, Italian diplomat, political philospher, musician, poet, and playwright (1469-1527). “It's not the will to win, but the will to prepare to win that makes the difference." Paul William "Bear" Bryant, American college football coach best known as the longtime head coach of the University of Alabama football team (1913 – 1983). "Don't get so set on your goal that you lose your humanity." Cicero Roman author, orator, & politician (106 BC - 43 BC). so are all innovations, which are the births of time." Francis Bacon, English philosopher, statesman, spy, Freemason and essayist (1561 – 1626). Daniel Hudson Burnham, American architect and urban planner (1846 – 1912). "People go from denial to despair stage so quickly that they don't stop right in the middle and do something about it." "If you cannot do it inside the company - you cannot extend it beyond." "If you could do it on your own - you would have done it by now." "Sometime you have to let the monkeys drive." "Sometimes you have to slow down, in order to speed up." "Words alone are not an investment." "Our ambitions will always exceed our ability to execute given the available level of resources." "The world is finite; we become larger." Greg J. Olson, writer, thinker, entrepreneur, business catalyst, doer.